You are probably one of the people who believe in the power of knowledge, and who understand that humans could solve their problems if they understood the world better. More and more people in the world suffer from Information Fatigue Syndrome - stress from too much information. This text shows you how to manage information and knowledge. There are no fantastic miracles. Everything in this article is based on facts and science. For 18 years, Dr Wozniak has been working on the problem of effective learning. As a student of molecular biology, he understood how he could improve the quality of his actions if he could remember more. 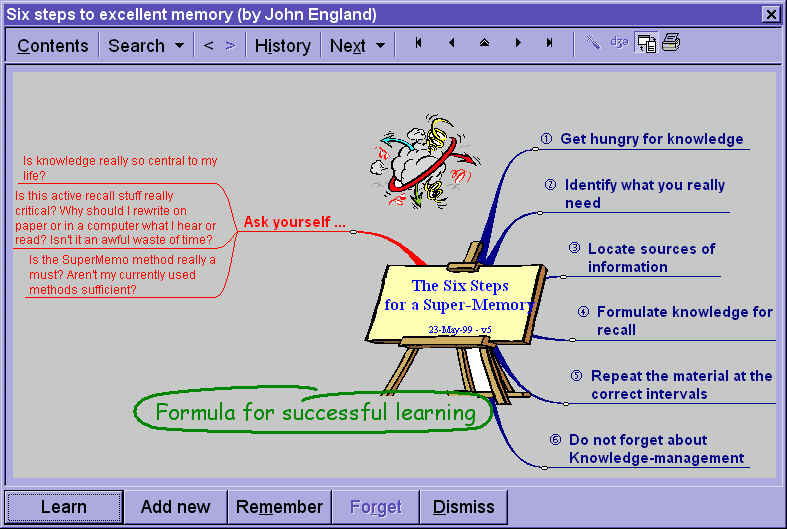 He needed to improve his ability to remember what he studied for exams (and not only for exams). Now, he wants to share his experience with you. He wants many people to enjoy the power of knowledge. He believes that we can build a better world, if we can learn and understand more. He represent a commercial company, but you don't need to spend a penny. You can improve your learning ability by reading this article. Spend 20 minutes on this article and you will learn how to learn more effectively. The first three points may be obvious to you. Please don't stop reading. Is knowledge so important in my life? Is active recall so important in learning? Is it important to reformulate everything I learn? Isn't this a waste of time? Do I have to use the SuperMemo method? Maybe my current methods are good enough? Reading articles, learning new methods, installing new software, and spending money can be reasons for you not to try. Maybe you will find it hard to do regular repetitions every day?